Priced at $330, the Canon PowerShot SD3500 IS design features a 14.1-megapixel sensor and a 5x optical zoom lens with equivalent focal lengths of 24-120mm, a generous wide-angle to a moderate telephoto. Maximum aperture varies from f/2.8 to f/5.9 across the zoom range. Canon has included a true optical image stabilization system in the PowerShot SD3500 IS, which combats blur from camera shake. The Canon SD3500 IS lacks any form of optical or electronic viewfinder, with all interaction taking place through its rear-panel LCD display. The Canon SD3500's display has a 3.5-inch diagonal, and offers 461,000 dot resolution. LCD coverage is said to be approximately 100%. As well as still images at resolutions up to 4,320 x 3,240 pixels, the Canon SD3500 can record high definition 720p (1,280 x 720) or standard-definition movie clips at either VGA (640 x 480) or QVGA (320 x 240) resolution, with a rate of 30 frames per second in H.264 MOV format, and including monaural audio. Exposures are calculated using the Canon SD3500's evaluative metering system, which also offers center-weighted average and spot modes. No manual control over the look of images is provided, with the Canon PowerShot SD3500 instead providing a choice of Auto, Program Auto, and sixteen Scene modes. These include Portrait, Night Snapshot, Kids & Pets, Indoor, Smart Shutter, Low Light, Color Accent, Color Swap, Fisheye Effect, Miniature Effect, Creative Light Effect, Beach, Foliage, Snow, Fireworks, and Long Shutter. Seven white balance modes are available, including Auto, five presets, and manual. The PowerShot SD3500 IS has a seven-mode flash with a range of 1.6 to 11 feet at wide-angle, or 3.0 to 6.6 feet at telephoto. The Canon PowerShot SD3500 IS stores images and movies on Secure Digital, SDHC, or SDXC cards. Connectivity options include mini-HDMI high definition or NTSC / PAL standard definition composite video and USB 2.0 High Speed data. Power comes courtesy of a proprietary NB-6L lithium-ion rechargeable battery, rated as good for a battery life of 220 shots. The Canon SD3500IS ships from late February 2010 in the US market for USD$330. Canon's Digital ELPHs rank among the best-selling compact digicams. And why not? They take quality photos, are easy to use and have sleek, sophisticated designs. I've used many of them over the years and they've rarely disappointed. 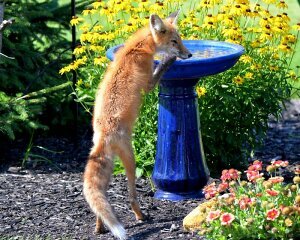 In fact when non-camera geeks ask which digicam they should buy I usually recommend "one of the higher-end ELPHs." The Canon SD3500 is one of newer high-end ELPHs and takes the place of last year's SD970 IS as top-of-the-line. Although $50 less (MSRP), the Canon SD3500 IS has more resolution (14.1 megapixels vs. 12.1MP) and a faster, much wider-angle 5x optical zoom (24mm vs. 37mm). On the ergonomic front, the new model has a 3.5-inch Pure Color LCD touch screen that handles almost all basic and advanced operations. In fact there are only two buttons on the camera along with a shutter/zoom control and basic mode switch. Along with the sensor and lens, the touch screen is one of the most critical features of this edition. Now let's see if I'll keep recommending ELPHs to friends and family. Look and feel. Although not a curvy as previous ELPHs, the Canon SD3500 has soft, rounded edges and a two-tone body. In our instance it was a silver front with a black bezel on the rear. Other color combos available include all black and pink/black. Canon continues the classic "box and circle" design as the lens is surrounded by shiny metallic rings. You'll also find an embossed logo and few decals. Also on the front is an AF-Assist lamp and the built-in flash. The Canon SD3500's dimensions are 3.91 x 2.2 x 0.87 (WHD, in inches) and it tips the scales at 5.64 ounces with card and battery (99.3 x 55.7 x 22mm/160g). Overall the Canon SD3500 is an attractive camera with a nice feel and heft. It'll slip right into your pocket; but make sure there are no keys or coins there to avoid scratching the screen. Almost 90 percent of the rear real estate is covered by seemingly huge 3.5-inch touch screen rated a fine 461K pixels. Similar in count to those found on the company's best digicams (G11/S90), it has excellent black levels and detail. Given the huge screen and compact size, the thumb rest on the far left is a bit narrow and your thumb definitely moves to the top right of the screen. It's not a big issue but carrying a lens cloth to eliminate oily fingerprints makes a lot of sense. Controls. On the top are the only hard controls including Power, Playback, a three-position Mode switch and the shutter surrounded by the Zoom toggle. The 2-pinhole mic is here as well. The buttons are rather tiny and you'll use a nail tip to engage them. This is a bit of a hassle but hardly something that should eliminate the camera from contention. If you need the owner's manual to get started with this baby, clearly it's the first camera you've handled in about 10 years. Canon does supply a printed 36-page "Getting Started" guide, just in case. On the right side are two compartments covered by doors with rather flimsy hinges. One is for mini-HDMI out and the other is USB or A/V out. Between them is the eyelet for the wrist strap which also has a moveable toggle to use on the touch screen if your fingers can't do the job. Definitely attach the strap for safety and convenience. The left is bare, other than a tiny speaker. On the bottom is the combo battery compartment card slot and tripod mount. Lens. It's nice seeing camera manufacturers embrace wider-angle zooms for their pocket digicams. Here Canon uses a very wide 24mm equivalent for dramatic images of buildings among other subjects, and it'll capture the largest family gatherings. The 5x zoom reaches 120mm on the tele end, providing a very inclusive range for a pocket digital camera. The lens doesn't protrude much from the body, putting it at less risk from impact damage. Occasionally I felt the need for a more zoom but those instances were rare as I enjoyed the broader vistas during my tests. The Canon lens uses seven elements in six groups with one double-sided aspherical lens (including one UA lens) and two single-side aspherical lenses (including one UA lens). Compared to last year's SD970, the Canon SD3500's lens has a faster f/2.8 aperture versus f/3.2. In theory this should help in low-light scenes. On the tele end, the spec is f/5.9. There are no individual aperture adjustments--other than those made by the camera via specific Scene modes--so if you're looking for that level of control and you're a Canon fan, the S90 and G11 are more your speed. Thankfully, the Canon SD3500 has optical image stabilization to help eliminate blur. It also has a 9-point AF system so the camera most often picks the right foreground subjects, rather than focusing on the background. As part of the touch screen system, there's also Touch AF where you can zero in on a specific area of the frame simply by tapping that spot on the screen when you're in Program mode. You can use this to target a specific face when you're Face Detection mode or a specific area if you're not. Modes. The mode switch on the top of the camera moves you between Smart Auto, Program, and Movie. Like iAuto from other manufacturers, the Canon SD3500's Smart Auto analyses the scene in front of it and adjusts the camera accordingly. Depending on the light and subject, the system will pick between 22 options, many more than competitors. I found it worked well. Going beyond Smart Auto is Program which gives more options, but don't expect the advanced tweaks available on a DSLR. 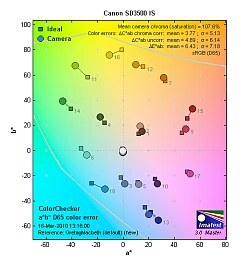 Here you can change the Canon SD3500's metering (Evaluative, Center-Weighted, Spot), exposure compensation (+/- 2 EV), White balance (six options including custom), Sensitivity (ISO 80-1,600), Drive mode (single shot, continuous), as well as resolution and compression. Again there are no aperture or shutter speed adjustments. The camera has a good selection of Scene modes when you're in Program. Just tap the "P" and your options pop up on a number of screens. You can choose from Portrait, Night Snapshot, Kids, Indoor, Smart Shutter (which engages Face Detection), Low Light, Color Accent, Color Swap, Fisheye, Miniature and Creative Light Effects, Beach, Foliage, Snow, Fireworks, and Long Shutter. The only ones that are bit unusual are the Fisheye, Miniature Effect, and Creative Light Effect, which we'll cover in the "Shooting" section. And like some other digicams we've tested recently, there is no dedicated Macro mode. It will automatically use that setting and show the icon in Smart Auto when you're shooting closeups. The Canon SD3500 captures high-definition movies at a resolution of 1,280 x 720p at 30 frames per second using the MOV file format; sound is mono. A 4GB high-speed card holds around 22 minutes of best quality video so if you really plan on going Hollywood, pick up an 8-gig card. Menu. Canon menus have always been very logical and relatively easy to understand, but there are always a few head scratchers. The Canon SD3500 continues this tradition, but instead of using a four-way controller, you tap on the screen. Before getting into details, let me point out a cool feature. Menus and the related text have a blue-gray color combination in the default mode. If you don't like this color scheme you can pick Khaki, Pink, or Orange accents (I chose Orange). When you power up in Smart Auto, you're shooting at 14.1-megapixel resolution with a 4:3 aspect ratio. The image takes up the center of the screen and icons flank it on the left and right. On the left is an icon for the flash and Function while the right shows the Smart Auto icon, Self timer, and Display. Flash can either be Auto or Off, the only Function you can change is resolution. Here's where one of head scratchers arises. Only when you tap Function does the Menu icon appear on the right. Why not have it on the main page? Who knows what they were thinking? Under Menu you can engage the digital zoom (I never do), AF Point Zoom, the AF Assist Beam, Flash (red-eye correction, red-eye lamp), Blink Detection, grid lines, the icon layout and date stamp on/off. Just tap what you prefer and you're good to go. When you first start the camera, it has you calibrate the screen by tapping x's at various points on the display for greater accuracy. I found tapping with a nail worked best rather than a fingertip. Move into Program and you have the options as detailed earlier in the modes section. Again when you hit Function, Menu appears on the right. Now you can adjust the AF Frame (Face AiAF or fixed frame small or normal), Servo AF, and i-Contrast which helps retain detail in shadow areas. You can also set the type of image stabilization (continuous, shoot only, panning). Brief text messages explain each setting so you'll barely need to crack the Getting Started guide or the 180-page owner's manual on the CD-ROM. In Movie mode, you'll see the Pure Color screen in all its glory as it makes use of the 16:9 widescreen shape. The icons are overlaid on the scene. 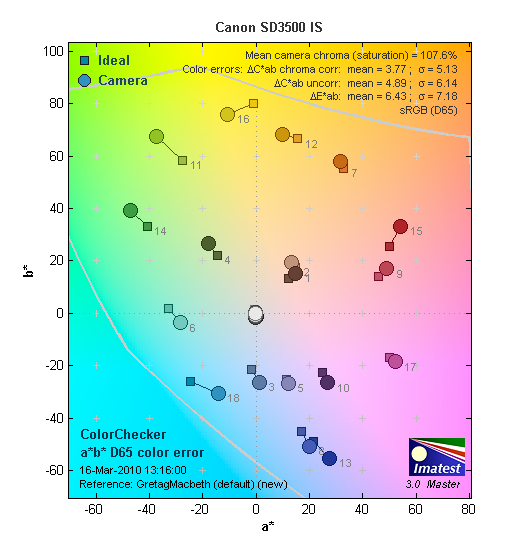 There are just a few options including resolution, exposure compensation, My Colors, white balance, and focal range. The optical zoom does not work in Movie mode (only digital) but IS does. Storage and battery. The Canon PowerShot SD3500 is one of the first cameras to accept new SDXC memory cards with the potential for storing up to 2 terabytes. It also accepts more prosaic Secure Digital and SDHC media. Since prices for SDHC cards are so reasonable, 4GB is a good starting point, but go for 6 or 8GB if you plan to shoot a lot of video. The camera has no internal memory, so you'll need to pick up a card when you purchase the camera or use one of your old ones. The battery supplied with the camera is good for 220 shots, but I didn't get that many since I was using the touch screen often, exploring its capabilities. Even if you're more conservative with your usage, a spare battery is a worthwhile investment--especially if you plan to travel. Wide-angle. 24mm gets more in the shot, even in the narrow streets of New Orleans. Just as it's simple operating the touch screen menu, taking photos with the Canon SD3500 is about as effortless as you could want. With so few photographic tweaks available, you just frame your subject, hit the shutter release, and you're done. This is exactly what I did over a period of several weeks, which included one of the most photogenic cities around, New Orleans--and this was during Lent, not Mardi Gras, or a Super Bowl parade. For the most part, the camera was used in Program at full 14.1-megapixel resolution, but many shots were taken with Smart Auto, the true aim-and-forget mode. Grid lines, Continuous IS, Face/Blink Detection, and most other functions were engaged other than the digital zoom. Touch screen. Before getting into the photographic results let me recount my experience using the Canon SD3500, particularly the touch screen. Since there's no viewfinder, you're totally at the mercy of the LCD; we should all be so lucky with other aspects of our lives. I used it in direct sunshine and had no problems whatsoever. The screen has black levels that rival some OLED screens I've seen. It works in all light situations and I never had an issue trying to angle it so I could see my subject. And playing back stills and videos was a joy as you could really examine them closely with a truer sense of the colors you actually captured. It's a winner, as is the touch screen operation that ranks up there with Sony's latest efforts--and even tops it in some cases. Macro. Quite sharp in the center; ISO 400 does fine for this shot, but struggles as detail increases. I spent a lot of time walking New Orleans streets and cemeteries as well as by the Mississippi, taking tons of shots and video clips. Thanks to the 9-point AF system, the camera quickly locked in and fired away. Shutter lag is a respectable 0.53 at wide and 0.44 second at telephoto. Prefocus, and the lag time drops to a blazing 0.08 second. Startup time is about 2 seconds, which is about average. I love wide-angle shooting and the 24mm setting was great for the old buildings and statues while the 120mm end let me capture architectural details. The Canon SD3500 is not the speediest demon on the block and it's rated 0.7 frames per second at full resolution. Sports fans, this one won't cut it, but neither will most pocket digital cameras; anyone shooting static scenes will be more than pleased. People portraits are also quite good as the Face Detection AiAF did a fine job. Daylight. The 14-megapixel sensor is a little noisy even in bright sunlight, making it a better outdoor camera than indoor. I always turn out a number of 8x10 full-bleed prints with no post processing to see how well the camera works. I also review photos over 100% on the monitor and play them back (stills/video) on a 50-inch plasma via HDMI in this case. My prints mirrored the lab results. There were soft corners with telephoto and middle focal lengths. Wide-angle corners are soft too, but more because of chromatic aberration than actual softness. Chromatic aberration is mild at telephoto, but stronger at wide-angle. There was no pincushion distortion at telephoto, but some barrel distortion at wide-angle. Macro shots are sharp in the very center, but chromatic aberration starts quickly moving out from the center, and softness, too, takes over as you leave the center. The Canon SD3500's flash is reasonably powerful for its size, but the camera raises the ISO to 500 to get this reasonable exposure at the manufacturer's specified distances, so image quality suffers somewhat. That said, the printed results were quite good especially for people portraits. When there was plenty of sunshine, the Canon SD3500 delivered excellent results. Unfortunately there's heavy noise suppression even in low ISO images, likely due to the 14-megapixel sensor. Shots of a flower arrangement taken indoors with available light produced good colors but digital artifacts were noticeable. Tungsten lighting resulted in a yellow cast. Even with all this issues on the table, print quality was good and the optical image stabilization did yeoman's work eliminating blur. Scene modes. Although most of my shots were taken in Program and Smart Auto, I did use some of the scene modes including Fisheye, Miniature Effects, and Creative Light Effects. Fisheye is fun, as it distorts straight lines such as trees and buildings. Miniature is a weird one as it keeps the center section of your subject in focus but blurs the top and bottom. Its appeal was lost on me as was Creative Light effects. I'd rather shoot with a nice wide-angle zoom, thank you very much. Also shooting in Low Light was just okay. Even with the dip in resolution to 3.5 megapixels, a candle in the dark was filled with noise. And since this is a 14.1-megapixel point-and-shoot, it has very serious noise issues beyond ISO 400. The faster f/2.8 aperture really didn't help that much. It's not even in the same league as the Canon S90's f/2.0 coupled with its larger 10-megapixel chip. Movie quality is good but a shadow of any new AVCHD camcorder. The fact you can walk around taking snapshots, then switch to video if the mood hits--as it did with a New Orleans paddle wheeler or street band--is an added bonus. On a small computer screen, video is fairly smooth, though the image stabilization seems jerky. The 50-inch blowup on my home TV is too much to ask for. Blocks are very noticeable. Playback. The high-quality screen makes it a real pleasure reviewing your shots--even if they weren't framed properly or your subject happened to move! The Canon SD3500 lets you review your images in a variety of ways and gives access to a number of onboard editing features. At its most basic, you simply tap the left or right side of the screen and "walk" through your shots. You can also swipe the screen to advance or go backwards. By moving the zoom toggle you can get a number of index views. Once you have a shot you'd like to examine more closely, if you tap it, a lot of the metadata appears along with a histogram. Tap it again and you'll get a closeup of a small section so you can check the focus. Inside this zoomed window, you can use your finger to move the image and inspect various areas (it zooms to detected faces by default, or else the main selected AF point). By tapping the Function icon on the lower left, you have access to features that let you rotate, protect, tag as favorites, and delete shots. Smart Shuffle grabs four similar images and surrounds the main one. This works well on a big screen HDTV. You can also filter the playback by date, category or file type, start a slideshow, or designate shots in specific categories. Hit Menu and you have access to a number of editing functions such as trimming and red-eye reduction, plus you can add i-Contrast shadow processing to photos. And since the screen is so good, you can really examine your work. It's a lot of fun. The Canon SD3500 has Canon's Active Display, which is another weird feature. Rather than tap on the screen to advance forward or backward, you tap the right side of the camera. Angle it while pressing the left side of the screen, you can quickly advance through your shots. Call me "old fashioned," but I'd rather just tap or swipe the screen itself. If you do this trick, make sure the camera is secured by the wrist strap so it doesn't hit the ground if it slips out of your hand; this is not a ruggedized digicam. Sharpness: The Canon SD3500's wide-angle lens setting produced very soft corners, with strong blurring that extends fairly far into the frame. At telephoto, the left corners were significantly softer than center, though the right corners maintained better sharpness. Geometric Distortion: There is noticeable barrel distortion at wide-angle (0.8%), which is about average among cameras we've tested. At telephoto, though, pincushion is minimal (0.2%) and only a slight dip at the very center is visible. Chromatic Aberration: Chromatic aberration is high at both wide-angle and telephoto, though this is in large part due to some strong blurring in the corners here. Pixels are quite bright at wide-angle, with distinct cyan and magenta casts, while at telephoto, the distortion is less bright with stronger blue and red tones. Macro: The Canon SD3500's Macro mode captures sharp details throughout most of the frame, though blurring is significant along the left side. Brooch, dollar bill, and coin details are all distinct and sharp, however. Minimum coverage area is 2.64 x 1.98 inches (67 x 50mm). The flash produced an uneven exposure at this range, with strong falloff in the lower right corner, and a bright hot spot upper left of center. Color: The PowerShot SD3500 IS produced good overall color, though with some minor oversaturation of bright tones like reds and blues, and bright greens. Hue accuracy is a little better than average, as shifts are relatively minor. Cyan is lightly pushed toward blue, while yellow moves toward green. Dark skin tones look about right, if slightly red, while lighter skin tones are just a hair warm. Overall, though, good results. ISO: Noise and Detail: Noise suppression efforts are already visible at ISO 80, though detail is still fair to about ISO 200. Chroma (color) noise is fairly well controlled at all ISOs, but luminance noise increases in intensity. By ISO 1,600, detail becomes a wash of color. See Printed results below for more on how this affects prints. Flash: Our manufacturer-specified testing (shown at right) shows bright results at the rated wide-angle distance of 11 feet, but with an increase in ISO to 500. The telephoto test also showed good results at its rated distance of 6.6 feet, (again ISO 500). Thus, the Canon SD3500's flash is usable at its maximum rated distances, but image noise is high. In practical application though, stay well within those ranges. Auto flash did a nice job retaining some of the ambient light by raising the ISO to only 320 and using a slow shutter speed of 1/15 second. This produced a warmer image than Auto Portrait Flash. Results are nice, but subject and photographer will have to remain very still. Auto Portrait Flash used ISO 200 and 1/60 second, producing a flatter, underexposed image, but one that's more likely to freeze motion. Shots taken at ~5 feet (~1.6m) on a stable tripod. Incandescent: The Manual white balance setting handled our household incandescent lighting best overall, with the most accurate white values. Auto white balance also looked pretty good, though a hint red, while Incandescent mode produced a very strong pink cast. Printed: ISO 80 and 100 prints are usable at 13x19 inches, but many areas are too soft for even wall display, especially dark red on red, as is seen in our still life. Noise suppression is active, often producing excellent results, sometimes skewing them. All factors considered, the better maximum print size is 11x14, something we're seeing in many of this year's early 14-megapixel cameras. ISO 200 shots are just usable at 11x14 inches, but optical softness is pretty noticeable at this size, requiring a reduction to 8x10 to get satisfactory results. ISO 400 shots look fine at 8x10. ISO 800 shots are a little too soft at 8x10, but look good at 5x7. ISO 1,600 shots are usable at 5x7, but look less soft at 4x6. Overall, the Canon SD3500 performs more like a 6-megapixel camera than what one would expect from 14 million pixels, while Canon's 12-megapixel cameras from this year's crop perform noticeably better. Shutter lag: Full autofocus shutter lag is good, at 0.53 second at wide-angle and 0.44 second at full telephoto. Prefocus shutter lag is 0.080 second, not the fastest out there, but still pretty quick. Cycle time: Cycle time is on the slow side, however, capturing a frame every 2.4 seconds in single-shot mode. Canon rates the SD3500's full resolution continuous mode rate at 0.7 frames-per-second. Flash Recycle: The Canon PowerShot SD3500 IS' flash recycles in a relatively slow 7.5 seconds after a full-power discharge. Even with its flaws, the overriding impression of the Canon PowerShot SD3500 IS Digital ELPH is a good one. The screen is a beauty and the touch screen works well. You won't miss the classic four-way controller and center set key. The 5x focal length is a real pleasure, especially the 24mm wide-angle option. Canon's optical image stabilization goes a long way toward helping you capture crisp, detailed images. Printed results, while satisfactory for snapshot printing at up to 11x14 inches, don't rise to the level achieved by 12-megapixel cameras from Canon and other manufacturers thanks to overaggressive noise suppression. Shots taken in good light were good, with the rich Canon colors I like. Images captured in lower light had their issues as we pointed but those taken with the flash--especially people--were quite good. The Canon SD3500 is a pretty good snapshot camera with an interesting interface, but overactive noise suppression reduces output quality too noticeably for the enthusiast. However, if you're one to print only 4x6-inch prints with some cropping, and like a pure touchscreen interface, ignore the resolution and give the Canon SD3500 a try.